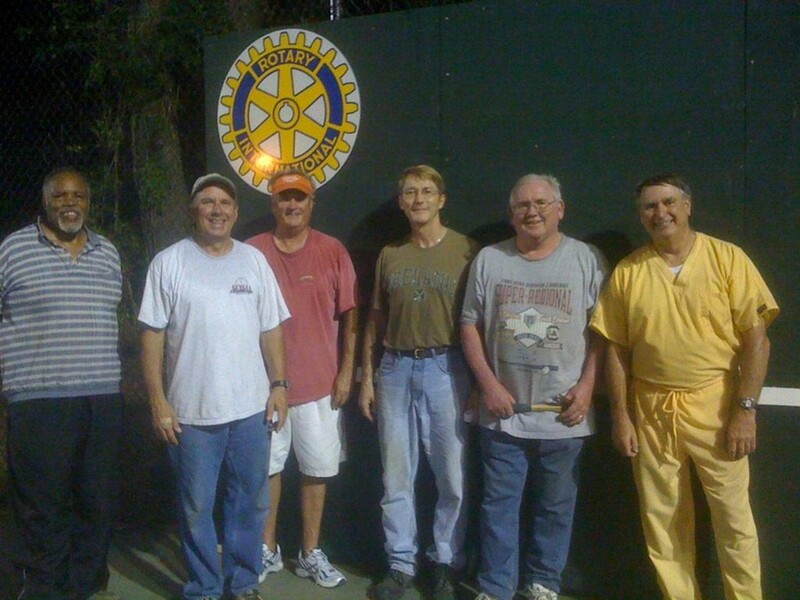 From the beginning, the St. George Rotary Club has been a generous supporter of St. George Jr. Team Tennis. Their most recent contribution is a "Grits Festival green" practice backboard at the tennis courts. The backboard has already proved to be an important training tool for our kids, coaches, and visiting players. It is designed for a player to get extra practice on their volleying, not only making their aim more efficient, but increasing their speed as well! As a thank you for all their awesome support, St. George Tennis presented the Rotary Club with a plaque showing our appreciation. The presentation was made at the Rotary Club's Summer Social on July 21st, 2011 at Gatherings in Dorchester. The "tennis table" included Barbara Jones, Mayor Anne Johnston, Councilwoman Clarine Barton, and coaches Peggy Carn, Daniel Walters, Amy Limehouse, Dion & Joyce Straub and Laren Clark. Many thanks to the St. George Rotary Club for their generous and constant support of St. George Tennis!